(Francisco Kjolseth | The Salt Lake Tribune) Gonzaga Bulldogs forward Brandon Clarke (15) dunks over Fairleigh Dickinson Knights forward Mike Holloway Jr. (34) as Gonzaga faces Fairleigh Dickinson in their first round menÕs NCAA March Madness tournament game at Vivint Smart Home Arena in Salt Lake City on Thursday, March 21, 2019. (Francisco Kjolseth | The Salt Lake Tribune) Gonzaga Bulldogs forward Brandon Clarke (15) dunks over Fairleigh Dickinson Knights forward Mike Holloway Jr. (34) as Gonzaga faces Fairleigh Dickinson in their first round menÕs NCAA March Madness tournament game at Vivint Smart Home Arena in Salt Lake City on Thursday, March 21, 2019. (Francisco Kjolseth | The Salt Lake Tribune) Fairleigh Dickinson Knights guard Tyler Jones (11) battles for the ball against Gonzaga Bulldogs guard Geno Crandall (0) as Gonzaga faces Fairleigh Dickinson in their first round menÕs NCAA March Madness tournament game at Vivint Smart Home Arena in Salt Lake City on Thursday, March 21, 2019. (Francisco Kjolseth | The Salt Lake Tribune) Fairleigh Dickinson Knights forward Kaleb Bishop (12) regains control of the ball over Gonzaga Bulldogs forward Rui Hachimura (21) as Gonzaga faces Fairleigh Dickinson in their first round menÕs NCAA March Madness tournament game at Vivint Smart Home Arena in Salt Lake City on Thursday, March 21, 2019. (Francisco Kjolseth | The Salt Lake Tribune) Gonzaga Bulldogs forward Corey Kispert (24) celebrates a three pointer with Gonzaga Bulldogs guard Zach Norvell Jr. (23) as Gonzaga faces Fairleigh Dickinson in their first round menÕs NCAA March Madness tournament game at Vivint Smart Home Arena in Salt Lake City on Thursday, March 21, 2019. (Francisco Kjolseth | The Salt Lake Tribune) Gonzaga Bulldogs guard Geno Crandall (0) passes past Fairleigh Dickinson Knights guard Darnell Edge (1) as Gonzaga faces Fairleigh Dickinson in their first round menÕs NCAA March Madness tournament game at Vivint Smart Home Arena in Salt Lake City on Thursday, March 21, 2019. (Francisco Kjolseth | The Salt Lake Tribune) The Fairleigh Dickinson band gets their team pumped up as Gonzaga faces Fairleigh Dickinson in their first round menÕs NCAA March Madness tournament game at Vivint Smart Home Arena in Salt Lake City on Thursday, March 21, 2019. (Francisco Kjolseth | The Salt Lake Tribune) Fairleigh Dickinson Knights head coach Greg Herenda yells at his team as Gonzaga faces Fairleigh Dickinson in their first round menÕs NCAA March Madness tournament game at Vivint Smart Home Arena in Salt Lake City on Thursday, March 21, 2019. (Francisco Kjolseth | The Salt Lake Tribune) Gonzaga head coach Mark Few keeps an eye on his team as Gonzaga faces Fairleigh Dickinson in their first round menÕs NCAA March Madness tournament game at Vivint Smart Home Arena in Salt Lake City on Thursday, March 21, 2019. (Francisco Kjolseth | The Salt Lake Tribune) Fairleigh Dickinson Knights guard Jahlil Jenkins (3) tries to block a three pointer by Gonzaga Bulldogs guard Josh Perkins (13) as Gonzaga faces Fairleigh Dickinson in their first round menÕs NCAA March Madness tournament game at Vivint Smart Home Arena in Salt Lake City on Thursday, March 21, 2019. (Francisco Kjolseth | The Salt Lake Tribune) Gonzaga Bulldogs guard Geno Crandall (0) is pressure on his way to the basket as Gonzaga faces Fairleigh Dickinson in their first round menÕs NCAA March Madness tournament game at Vivint Smart Home Arena in Salt Lake City on Thursday, March 21, 2019. (Francisco Kjolseth | The Salt Lake Tribune) Fairleigh Dickinson Knights forward Kaleb Bishop (12) puts the pressure on Gonzaga Bulldogs forward Brandon Clarke (15) as Gonzaga faces Fairleigh Dickinson in their first round menÕs NCAA March Madness tournament game at Vivint Smart Home Arena in Salt Lake City on Thursday, March 21, 2019. 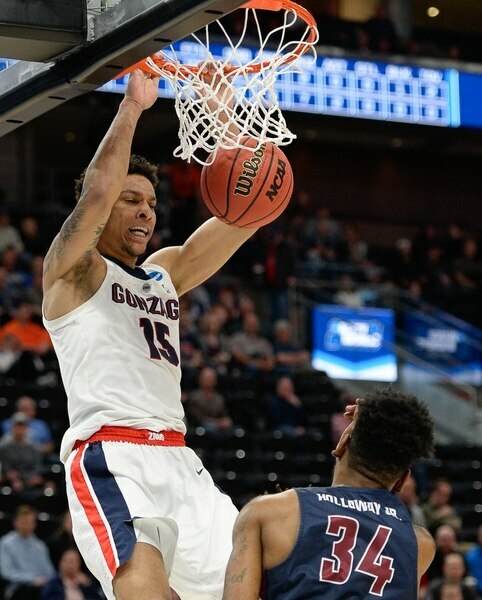 (Francisco Kjolseth | The Salt Lake Tribune) Gonzaga Bulldogs forward Brandon Clarke (15) dunks the ball as Gonzaga faces Fairleigh Dickinson in their first round menÕs NCAA March Madness tournament game at Vivint Smart Home Arena in Salt Lake City on Thursday, March 21, 2019. (Francisco Kjolseth | The Salt Lake Tribune) Fairleigh Dickinson Knights guard Brandon Powell (10) clothes lines Gonzaga Bulldogs guard Zach Norvell Jr. (23) as Gonzaga faces Fairleigh Dickinson in their first round menÕs NCAA March Madness tournament game at Vivint Smart Home Arena in Salt Lake City on Thursday, March 21, 2019. (Francisco Kjolseth | The Salt Lake Tribune) Gonzaga Bulldogs forward Rui Hachimura (21) pushes through to the basket as Gonzaga faces Fairleigh Dickinson in their first round menÕs NCAA March Madness tournament game at Vivint Smart Home Arena in Salt Lake City on Thursday, March 21, 2019. (Francisco Kjolseth | The Salt Lake Tribune) Gonzaga Bulldogs forward Rui Hachimura (21) feels the pressure as Gonzaga faces Fairleigh Dickinson in their first round menÕs NCAA March Madness tournament game at Vivint Smart Home Arena in Salt Lake City on Thursday, March 21, 2019. (Francisco Kjolseth | The Salt Lake Tribune) Fairleigh Dickinson Knights forward Elyjah Williams (21) blocks Gonzaga Bulldogs forward Rui Hachimura (21) as Gonzaga faces Fairleigh Dickinson in their first round menÕs NCAA March Madness tournament game at Vivint Smart Home Arena in Salt Lake City on Thursday, March 21, 2019. (Francisco Kjolseth | The Salt Lake Tribune) The Gonzaga band keeps the fan moving as Gonzaga faces Fairleigh Dickinson in their first round menÕs NCAA March Madness tournament game at Vivint Smart Home Arena in Salt Lake City on Thursday, March 21, 2019. (Francisco Kjolseth | The Salt Lake Tribune) The Fairleigh Dickinson mascot loses his head doing the splits as Gonzaga faces Fairleigh Dickinson in their first round menÕs NCAA March Madness tournament game at Vivint Smart Home Arena in Salt Lake City on Thursday, March 21, 2019. (Francisco Kjolseth | The Salt Lake Tribune) The Fairleigh Dickinson mascot loses his head doing the splits as Gonzaga faces Fairleigh Dickinson in their first round menÕs NCAA March Madness tournament game at Vivint Smart Home Arena in Salt Lake City on Thursday, March 21, 2019. (Francisco Kjolseth | The Salt Lake Tribune) Gonzaga Bulldogs forward Killian Tillie (33) delivers an arm full on Fairleigh Dickinson Knights forward Elyjah Williams (21) as Gonzaga faces Fairleigh Dickinson in their first round menÕs NCAA March Madness tournament game at Vivint Smart Home Arena in Salt Lake City on Thursday, March 21, 2019. (Francisco Kjolseth | The Salt Lake Tribune) Fairleigh Dickinson Knights forward Mike Holloway Jr. (34) manages to keep the ball in play as Gonzaga faces Fairleigh Dickinson in their first round menÕs NCAA March Madness tournament game at Vivint Smart Home Arena in Salt Lake City on Thursday, March 21, 2019. (Francisco Kjolseth | The Salt Lake Tribune) Fairleigh Dickinson Knights forward Mike Holloway Jr. (34) tries to keep hold of the ball with his legs as Gonzaga faces Fairleigh Dickinson in their first round menÕs NCAA March Madness tournament game at Vivint Smart Home Arena in Salt Lake City on Thursday, March 21, 2019. (Francisco Kjolseth | The Salt Lake Tribune) Fairleigh Dickinson Knights guard Brandon Powell (10) keeps his eye on the basket as Gonzaga faces Fairleigh Dickinson in their first round menÕs NCAA March Madness tournament game at Vivint Smart Home Arena in Salt Lake City on Thursday, March 21, 2019. (Francisco Kjolseth | The Salt Lake Tribune) Fairleigh Dickinson Knights forward Elyjah Williams (21) goes up for a shot over Gonzaga Bulldogs guard Geno Crandall (0) as Gonzaga faces Fairleigh Dickinson in their first round menÕs NCAA March Madness tournament game at Vivint Smart Home Arena in Salt Lake City on Thursday, March 21, 2019. (Francisco Kjolseth | The Salt Lake Tribune) Gonzaga Bulldogs guard Geno Crandall (0) battles Fairleigh Dickinson Knights forward Mike Holloway Jr. (34) for a loose ball as Gonzaga faces Fairleigh Dickinson in their first round menÕs NCAA March Madness tournament game at Vivint Smart Home Arena in Salt Lake City on Thursday, March 21, 2019. (Francisco Kjolseth | The Salt Lake Tribune) Gonzaga Bulldogs forward Filip Petrusev (3) watches his team fall to Gonzaga in their first round menÕs NCAA March Madness tournament game at Vivint Smart Home Arena in Salt Lake City on Thursday, March 21, 2019. (Francisco Kjolseth | The Salt Lake Tribune) Fairleigh Dickinson Knights guard Darnell Edge (1) and Fairleigh Dickinson Knights forward Mike Holloway Jr. (34) embrace as they fall to Gonzaga in their first round menÕs NCAA March Madness tournament game at Vivint Smart Home Arena in Salt Lake City on Thursday, March 21, 2019. But the Knights certainly played like one; Then again, maybe the No. 1 seed had something to do with that. 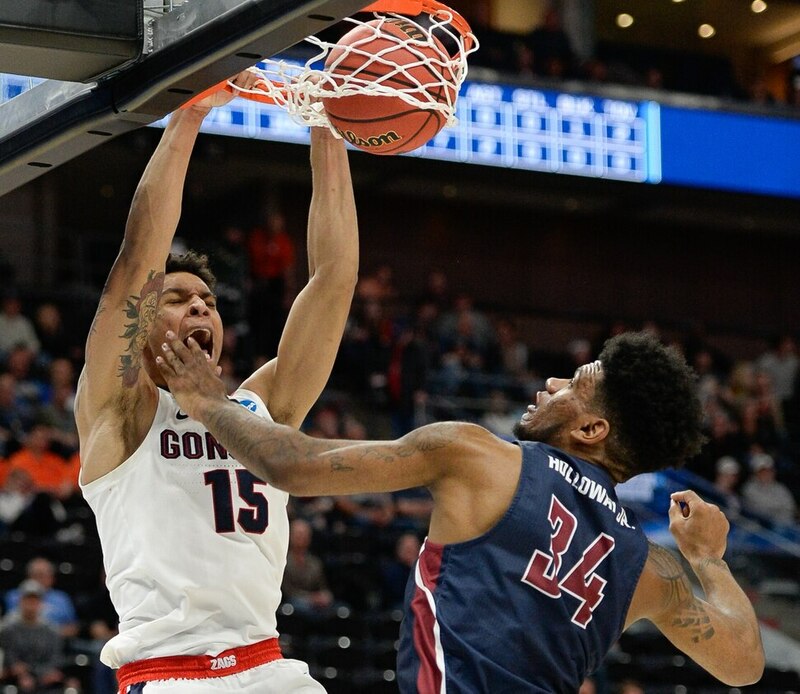 Gonzaga bounced back from its disappointing performance in the West Coast Conference championship game last week and pummeled the Northeast Conference tournament champions 87-49 on Thursday night. Gonzaga (31-3) won its 11th-straight first-round game and will meet the winner of the late Syracuse-Baylor game in a second-round game on Saturday in Salt Lake City. The 38-point win was the largest margin of victory in an NCAA Tournament game in school history, surpassing the 76-49 win over Valparaiso in 2004. “I loved our intensity from the jump. You nailed it. And also our attention to detail,” Few said. After scoring just 47 points nine days ago in a 13-point loss to Saint Mary’s that could have cost GU a No. 1 seed, but didn’t, Gonzaga reached that total with a minute, 45 seconds remaining in the first half on a Killian Tillie 3-pointer and rediscovered the offense that went missing in Las Vegas. Rui Hachimura led Gonzaga with 21 points and eight rebounds, while Zach Norvell Jr. had 13 points and seven assists. Brandon Clarke added 12 points and Tillie scored a season-high 17 in just his 12th game of the season. Tillie, the sixth man on a loaded team and a potential NBA first-round draft pick who has been slowed by a foot injury, provided the game’s best highlight with a punishing one-handed dunk in traffic with about 12 minutes left. “Just an absolute incredible amount of joy and satisfaction to see somebody that worked so hard, had such a great year last year for us,” Few said. Clarke was also impressed by the dunk, calling it “really crazy” and saying he’s been waiting for “that moment for him” all season. FDU, which dropped to 20-14, played less than 48 hours ago in a First Four game in Dayton, Ohio, and it showed. The Knights missed nine of their first 10 shots and were never in it. Gonzaga shot 58 percent in the first half in rolling out to a 53-17 lead. After scoring a career-high 33 points in FDU’s 82-76 win over Prairie View A&M Tuesday that got the Knights to Salt Lake City, senior Darnell Edge didn’t score until five minutes remained in the first half, and finished with just seven. Edge’s long 3-pointer and a subsequent trey from teammate Mike Holloway were FDU’s best moments of the first half and came after the Knights had missed 16 of their first 19 shots. 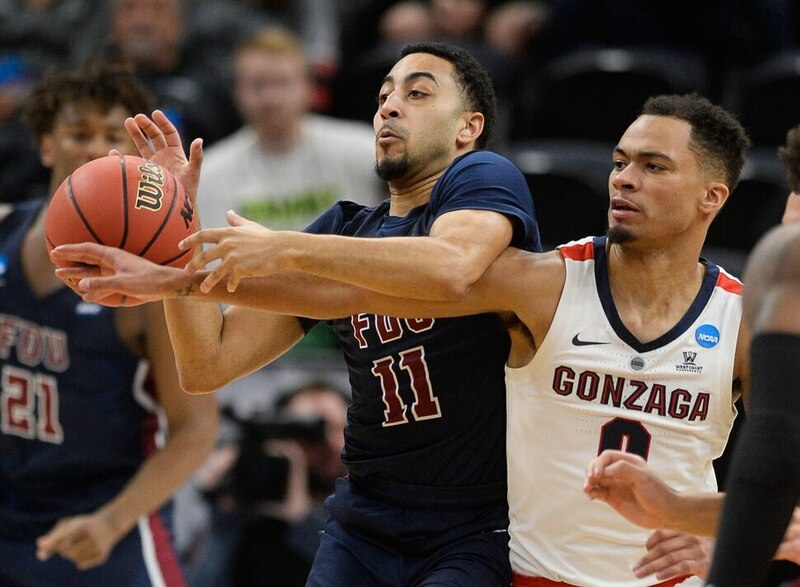 However, the bombs that merely cut GU’s lead to 34-17 did nothing besides irritate the Zags, who rattled off 19 straight points to end the half.